I’ve posted previously about my weekend coffee ritual. I love making coffee on the weekends because I can grind my beans, do a pour-over drip, and enjoy the process. Weekday mornings are a different beast altogether. 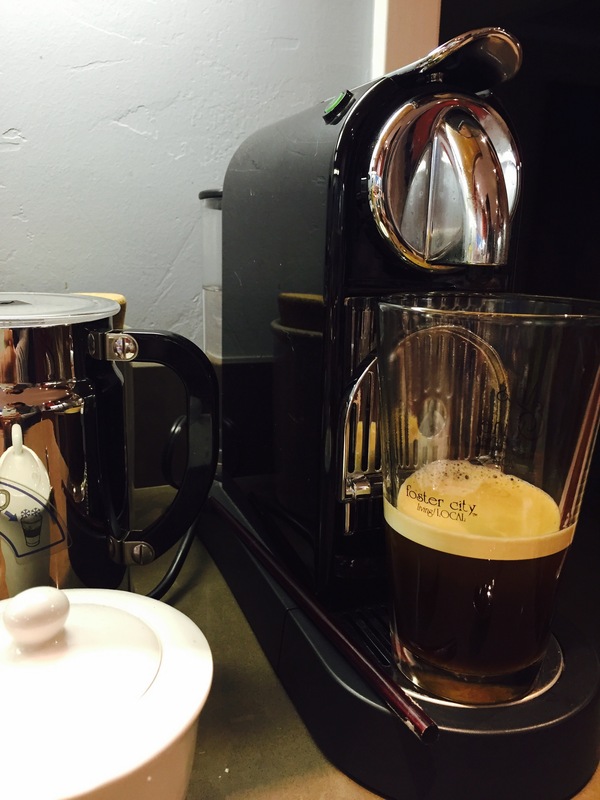 I don’t have much time, so I have to go quickly… Enter the Nespresso machine. I’ve been looking for something to add variety to my workouts. I knew I needed to do strength training, so I hit the gym yesterday and went to a body sculpting class. I used the lightest bar I could find. 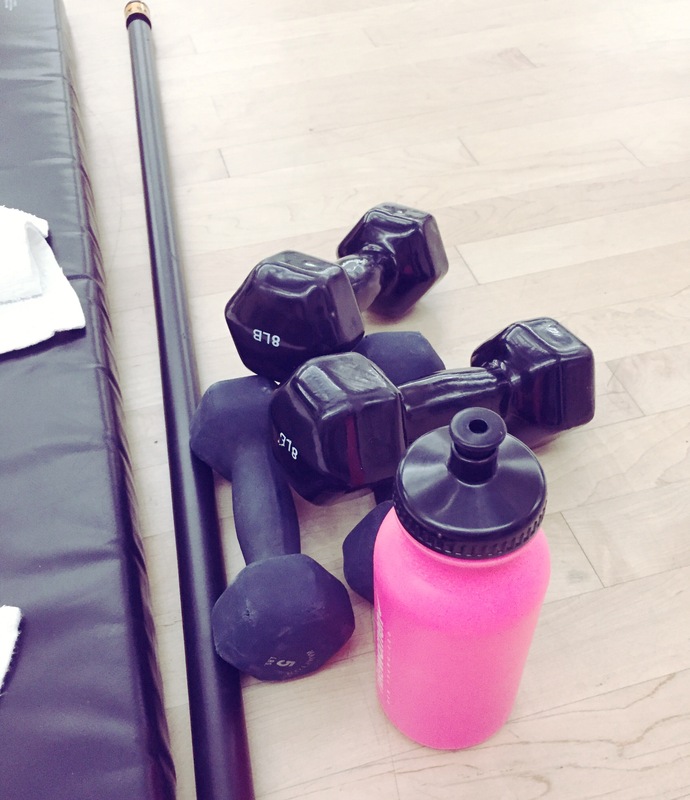 And, I used 5- and 8-pound weights… And I am still sore this morning. Wowsers! For the next 4 weeks, I’m going to be mixing it up. I’m planning to run 2 days a week, take cycle class 1 day a week, and take body sculpting 1 day a week. Let’s see if I can make a difference in my arms. They need some definition. Or in the least, they need less flapping. I have some time before I step up my running schedule. I ran three miles today and decided to do the second half with no tunes. Ok, not really. My earbuds died! Oh, they are plugged in and charging now… Now that it doesn’t really matter. But, hey! It’s something. Interestingly, I found that it was helpful to listen to my breathing. I was able to keep a better rhythm, which made me feel better… Which helped me run… wait for it… faster. I do focus on my breathing, but it was different when I was actually *listening* and not just *feeling* the in and out in and out. So, I feel like I learned a good lesson today. It’s perhaps a good idea to sometimes turn off the tunes and enjoy the silence (Depeche Mode anyone?). Thoughts? This morning, I got my @$$ out of bed at 5:30 so I could hit the gym’s 6am cycle class. What?!?! First of all, it’s been so long since I’ve done a class like this, the name has changed from “spin” class to “cycle” class. Oh my! I wanted a change of pace (haha – runner humor? ), so I thought, sure, let’s get up before the crack of dawn so I can pedal a stationary bike and pretend to climb hills. I did take 2 days off after Sunday’s half marathon, so let’s get back to business. The class was an hour and at the 30 minute mark, I remember thinking that it was BORING. Then, I started thinking that it was hard. Boring + hard? Ugh… I kind of got into it a bit more the second half of the class. It was definitely a calorie burner (~400), but can I do this regularly at 6am? We’ll see, we’ll see… YAWN! What are some other good classes or exercises to mix things up? Any and all suggestions welcome. I really need to figure out some upper body work… Seriously, now.. Suggestions? ORF went well overall… We stayed in Oakland Saturday night to make things easier. Originally, I thought it would be more helpful for my husband and son, but my son is going through a separation anxiety stage with me right now and it was really hard (and loud) when I left the room Sunday morning to head to the starting line. Ah, three year olds! The event was mostly dry, but I did get drenched in a downpour toward the end of the half marathon. Oh well, better than it raining the whole time! My performance was definitely not where I wanted it to be. If I can paraphrase Yogi Berra, running “is 90% mental and the other half is physical.” My brain wasn’t cooperating and I broke down and walked for a bit – not because of anything physical, really. It was a mental break that I just couldn’t control. I’ve been kicking myself ever since, but I’ll live… I did this half marathon three years ago and barely finished because of a MASSIVE calf cramp in my left leg. Honestly, it it hadn’t been for the amazing volunteers, I might not have limped across the finish line. The half didn’t start until 9:10 and for some reason, I don’t do so well if I get started after 7am… As you can see, my rationalizations have begun… Sleep deprived because my son hasn’t been sleeping… Didn’t get to finish my bagel… There are a hundred excuses, but I know the real reason is just that my head wasn’t in the game as much as my legs were. The Oakland police were fantastic. At one point, there was a car whose driver just didn’t care about road closures and was trying to cross through the runners… Yeah, OPD wasn’t having any of it and stopped them super quick. Thank you, OPD for being on the ball yet again. They have been great each time I’ve participating in ORF. Now *this* is a post-race meal! I’m still drooling over how good the bacon and eggs were. Seriously… Mmmmm…. Here are a few pics from yesterday. Yes, that is an arch with flames! Thanks to The Crucible for that one! I probably should have lead with the dog picture! He just wanted to cuddle and for some reason, didn’t want to accept my excuses about needed to stretch and avoid leg cramps. Silly dog. Next weekend, I am planning to get my first pair of trail shoes and am glad I have plenty of time to train and get my head in the game before the Yosemite Half in October. Run happy! Tonight, I am nursing a sore quad and glad this morning’s run was only 6 miles. Next weekend is the Oakland Running Festival and I am running the half marathon. Gotta get this quad feeling better! But, that’s not what I want to write about… I want to write about my morning coffee ritual. I have been working hard to perfect my home brewing technique and I am rather pleased with how things have been going. I’ve played around with several different coffees and my two favorites are Illy and Dillanos. Illy is an Italian coffee roasting company that specializes in espresso. Dillanos is a Washington-based coffee roasting company that focuses on speciality coffees. They are both DEELISH! Getting ready for my Dillanos! Weekend mornings, I get to make pour-over coffee and I delight in the process. I love making a great cup of coffee. I grind the beans that morning, and then use a Chemex brewer. My coffee experience starts with putting the water on the stove. Then, I grind my beans at a French press level – somewhat course. When the water is warm, I pour a little through the filter to eliminate any papery taste and to preheat my brewer. After dumping out the excess water, I put the beans into the filter and wait for the water to get just right. You want to get it just after the boil. Hope there are a few other caffeine and/or coffee addicts out there that can appreciate a good cup of home-brewed heaven. 🙂 I really do love the whole process. There is something calming about it… It’s a strange love affair, but it works for me. Have a great Sunday!! Seriously, what just happened to my foot? Now… This morning, I got ready for my 4-mile run… No issues… Until I put on my right shoe. The top of my foot hurt – I actually couldn’t do my run and came back home. I tried both pairs of running shoes, and had the same problem. Pain approximately where I tie my shoes. Only on the top, and only when I put on my shoes. Rubbing and poking and prodding on my foot caused no pain whatsoever. What happened??? I have no idea. I’m glad it stopped, but how weird!! Anyone have any ideas? Has anything like this happened to you?